Olga de Amaral is unique among contemporary Latin American artists. At the heart of this uniqueness lies in the fact that her work is essentially unclassifiable. For example, is it art or is it handicraft? The Crafts Revival, so-called, that took place in Britain and in the United States, in the late 19th century and the earlier years of the 20th, has no place in the history of Latin American art. Nor is there much that corresponds to a later phase of interest in handicraft, which affected artistic circles in the United States during the 1960s and 1970s, in the wake of the Vietnam war. In Latin America, craft —the French use the expressive phrase 'les metiers d'art'— is part of the folk art tradition. Olga, who makes what can loosely be described as tapestries and textiles, is nevertheless universally recognized as an important and completely individual artistic creator. In these circumstances it is necessary to look at the wider background. First, one must recall that the Pre-Columbian peoples were among the most inventive of all weavers. Many of the techniques they used were completely unknown outside the South American continent. Fortunate circumstances —conditions of extreme dryness or extreme cold, or a combination of both— have preserved a number of these weavings for our admiration today. What strikes one about them is that they have all the aesthetic confidence of great works of art. European tapestries, from the Renaissance onwards, tended to become more and more dependent on designs supplied by painters —that is to say by people at one remove from the actual process of production. What we admire about the result is often simply the ingenuity with which the weavers managed to bridge the gap between two different, and to some extent incompatible, aesthetic worlds. Another element in Pre-Columbian culture was the cult of gold. Anyone who visits the spectacular Gold Museum in Bogota must be aware that the region which is now Columbia lay at the very centre of this cult. It was this abundance of gold which fascinated the European conquistadors and led them into the commission of many crimes. Though both sides —Native Americans and Europeans— worshipped gold, it is clear that they worshipped it in different ways. For the original inhabitants of the Americas, the precious metal embodied the warmth and brightness of the sun. It also, because it was incorruptible, became a symbol of immortality. But it did not necessarily represent wealth, in the crude fashion that European understood this concept. A large part of Olga's production has been concerned with gold, but there are in fact no equivalents for what she makes in Pre-Columbian archaeology. Nevertheless one feels that such objects ought in logic to exist —that she has supplied a lack. There is, however, another and quite different way of looking at her work —an approach which involves an analysis of Latin American Modernism. It has been both the good fortune and the misfortune of 20th century art from the Spanish- and Portuguese-speaking countries of the Americas that what first attracted attention to them, or at any rate attention from outside, was the work of the Mexican muralists. The murals of Rivera, Orozco and others supplied Latin American art with an easily identifiable image - figurative, narrative, often highly politicised. This encouraged critics to ignore the fact that there was a flourishing alternative tradition of a very different sort. If this tradition stems from any single individual, it stems from the Uruguayan Constructivist Joaquin Torres-Garcia (1874-1949). It was Torres-Garcia who, after his return to Montevideo from Europe in 1942, founded the Asociacion de Arte Constructivo. This coincided with a renewal of avant-garde activity in other parts of Latin America - for example the foundation of two avant-garde groups, Madi and Concreto-Invencion in Buenos Aires in 1945. These groupings were not simply a continuation of the original European Constructivist impulse (which was beginning to lose momentum in its original habitat). They pointed towards something new. Essentially the roots of the Conceptual Art which was the blossom in New York in the mid 1960s and which was to be dominant worldwide during the following decade, are to be found in Latin American initiatives of the mid 1940s. If one looks at the work of the major Latin American abstractionists of the post war period, and these of course include the sculptors Edgar Negret and Eduardo Ramirez Villamizar working in Colombia itself, what one sees is an effort to integrate the desired form and the chosen material, so that these become inseparable. One also sees an increasing rejection of conventional formats and a search for structural logic. In some cases, as for example with the kinetic artists Carlos Cruz-Diez and Jesus Rafael Soto this search for logic led to an actual dissolution of form. In others, as with the gifted Brazilian Lygia Clark, it led to a complete abandonment of existing artistic conventions. Placed within this context of experiment, Olga de Amaral's work acquires a new resonance. One sees, for example, that her characteristic techniques involve the full integration of structure and surface which other artists in the region were trying to achieve in a perhaps less fluent way. Her tapestries become the precursors of the numerous 'off-stretcher' works which figured in Latin American biennials during the 1980s and 1990s. There is, however, another element as well. At first sight it seems to contradict much of what I have said above. Olga's most typical works breathe an undoubted feeling of luxury. They are alluring in a purely sensual way. This is not a quality which is popular with the supporters of a rigorously intellectual art. Yet the undoubted sumptuousness of her gold pieces in particular is often linked to an extraordinary feeling of otherworldliness. In one sense it is because they seem to have descended to us from some unknown ancient civilization. They invite us to create poetic fictions in our own minds about what such a civilization would be like. 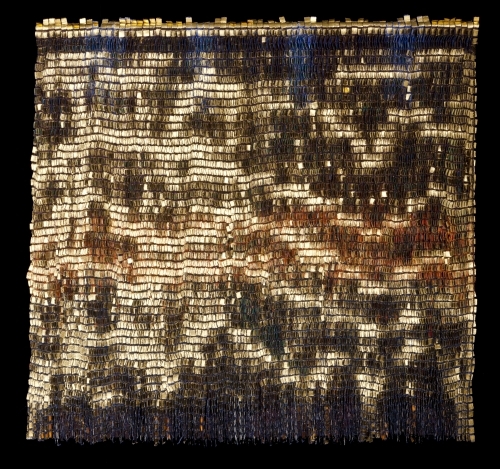 It would be interesting, one day, to see Olga's work sharing an exhibition with major Inca feather pieces from Peru. What was authentically 'pre-historic' would, I suspect, seem less romantically ancient than these productions of our own time. Yet there is another, more directly practical reason for the feeling of otherworldliness I have mentioned and this is the actual quality of her surfaces. Among the predecessors for her golden tapestries one might number the 'Monogolds' of the French artist Yves Klein, produced in the early 1960s. These, in turn, depend from Japanese sliding screens which Klein saw in Japan, when he was training at a karate school there. It is noticeable that, in order to give the 'Monogolds' character Klein felt compelled to dent their surfaces. The Italian artist Lucio Fontana, who sometimes favours monochrome metallic surfaces, felt compelled to attack these even more savagely. With Olga's work none of this is necessary. Her surfaces have a unique shimmer, a unique variability. They seem like a pure manifestation of the light which, as the Pre-Columbian populations of the Americas knew, rules all human lives.